The cast of “The Hot L Baltimore” are in full character during their dress rehearsal. 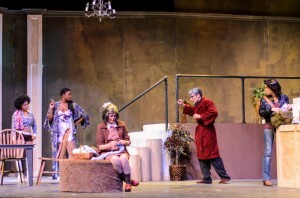 This year is the 80th anniversary of the Players of Georgia State University as the oldest producing theatre company in Georgia. Since opening their auditions in late August, they now have their cast for “The Hot L Baltimore” that tells a story about the journey of people attaining or losing their dreams. Starting last Thursday, Nov. 1, the show will continue to run from Thursday, Nov. 8- Sunday, Nov. 11 in the Dahlberg Hall University Theatre. In this play, the hotel’s marquee has a burned-out letter “e” that was never replaced, which is where this production gets its name. 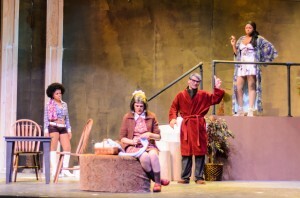 Written by Lanford Wilson, the play is set in the lobby of the hotel and when the building is condemned, the residents have to deal with eviction. Andre Eaton, senior double major in theatre performance and English creative writing said what makes the play a must see is that it’s regular people trying to obtain their dreams. The players’ success is as much attributed to the hard work of theatre students as it is to the hard work and dedication of theate professors. In his 14th year of advising the Players of Georgia State, Professor Todd Studebaker, who teaches theatre design and production at Georgia State and Clark University, continues to practice his craft while teaching others how to be sucessful artists. With passionate students filling up the University Theatre’s stage, the Players have been proud to present such shows as “Cloud 9” and “Everyman” last school year. Studebaker said he recognizes the level of dedication the students have for their craft. He said being a threatre major is even more demanding than being a football or basketball player because of the time commitment. Peforming and production are never ending. In addition to committment to theatre, students must posses enthusiam and eagerness as Eaton does. Eaton is an artist who said he loves acting. He said his acting career has been “pretty fantastic” so far, but admitted the way he started in theatre, which was during high school, was by accident. “I was supposed to stay after school for tutoring for some math class. I remember it being cancelled and seeing auditions and I was just like, ‘I’ll just go to that.’” He said he made the cast and continued to be sucessful at each audition. The “Hot L Baltimore” shows Nov. 1, 2, 3, 8, 9 and 10 at 8 p.m. and Nov. 4 and 11 at 3 p.m. Tickets are $10 for students faculty and Georgia State staff. For general admission, tickets are $15. For more information about the Players of Georgia State, visit their website at www.sites.google.com/site/playersofgsu/. The Players have their board meetings on Thursdays at 4 p.m. in the Players office on the first floor of Dahlburg Hall.